A new 2018 Dodge Challenger SRT Demon carried a base price of $84,995. For an extra $1, you could ( a crate of parts to help out at the drag strip). That price tag even includes the $1,700 gas guzzler tax. Not bad at all for what’s basically a . Now, it’s not like you could just walk into any Dodge dealership and place an order; you had to get in line first and even then there was no guarantee you’d get a spot. Only 3,300 Demons are being built, 3,000 of which are destined to the US while the remaining 300 are for Canada. Many dealerships who were allocated a Demon did the typical markups, . But what Dodge couldn’t stop was individuals buying a Demon and then selling it to someone desperate to have one. Such is the case of this gorgeous Plum Crazy Pearlcoat Dodge Demon for sale right now on . It has a ‘Buy it Now’ price of $225,000. With a mere 4 miles on its speedometer, the seller claims the car comes with all of the required paperwork, accessories, booklets, and even a Demon car cover, leather bound owner’s manual, and the laminated original window sticker. The must have Demon crate, however, is not included, but the eventual new owner can order that later. 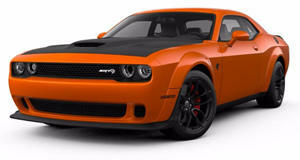 This Demon comes pretty well equipped, thus its total pricing coming to $97,967. Some options include the Comfort Audio Group, Demon logo Laguna/Alcantara seats, heated steering wheel, 18-speaker premium audio system, and a Harmon Kardon GreenEdge amplifier. The seller also adds that, as of right now, only 173 Demons have been produced with this exterior color, but there’s still a little time until production ends entirely. Also noteworthy is the fact the car is being stored in a climate controlled garage. Assuming the car ultimately sells for the price as listed, the seller will have earned themselves a healthy profit of $127,000. Admit it. Many of you would be tempted to do the same based on the Demon’s hot demand. Photos courtesy of roversrock114 via .